Nutrient Based Timing! WHEN you eat can be as important as WHAT you eat! Part II of my quest to create a Nutrient-Based society is taking a look at the timing of eating, especially when eating Nutrient-Based! Just as a recap from Part 1 that I’ve been featuring over the course of the last couple of weeks (HERE) the importance of having a Nutrient focus with each of your meals will help ensure that you get enough of the necessary vitamins and minerals! But, as you might have guessed, just being sure you are getting enough of the necessary vitamins and minerals does NOT necessarily mean that you are able to stay lean and fit! Quality of food IS an incredibly important step in the right direction, but it does not necessarily promote weight loss or physique goals! So, the next part I want to introduce to the Nutrient Based Diet is the TIMING of when you eat. While there are no rules to Finding “A. Wright Fit” for yourself, I have found that there are definitely some benefits to monitoring your eating patterns and adjusting how often you eat! It all boils down to just 3-Steps to Nutrient Based Timing! (If you’re interested in getting this printable infographic for you to add to the 5-Steps of the Nutrient Based Eating that you can get by signing up HERE). Step 1: Go minimum 12-hours without eating every night. Research has been showing more concretely lately that going extended periods of time in a “fasted” state at night, has been extremely effective in helping bodies avoid obesity, even when eating a high fat diet. It has been termed Intermittent Fasting in the fitness community. The concept of intermittent fasting was first introduced around 2009 and was popularized with a study that occurred in 2012. In this rodent research, three groups of mice were studied. One group was fed healthy food and the two others were fed the the same “higher fat” diet. 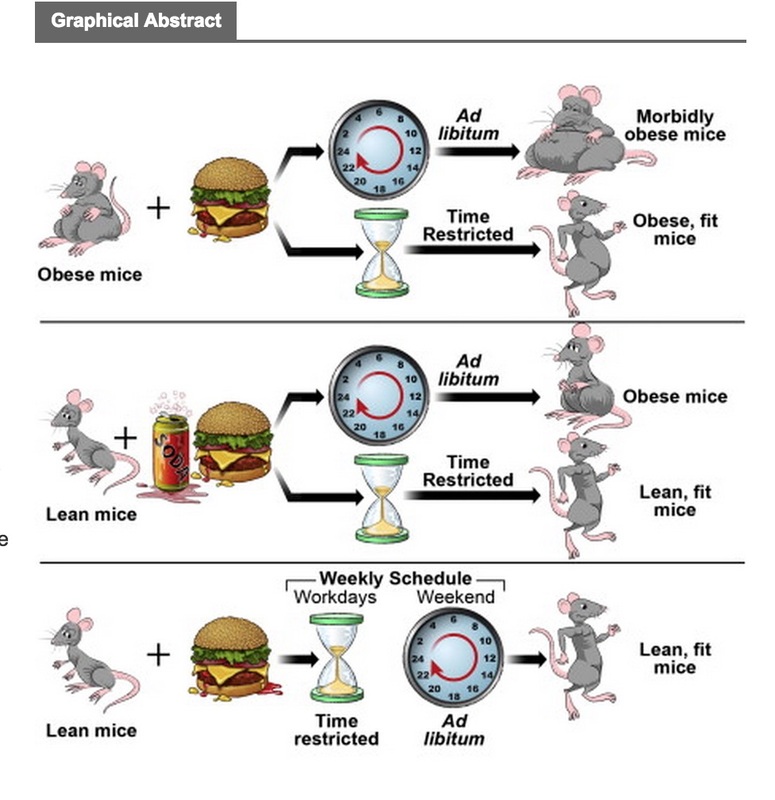 Of the high-fat diet, one group was allowed to eat at all times of the day (“ad libitum”) and the other group was restricted to eating only 8-hours of the most active part of their day. The group that actually restricted their diet to just the 8-hours of the day stayed just as lean as the group that ate “healthy” food. But the group that ate the same amount of calories and food, but ate at all hours of the day, became obese!! Read about this study HERE. Even more recently, another follow-up study has been done over a less drastic fasting time range that has equally shown great results. This study had 4 groups of mice fed differing diets and found that over a 38-week study, the mice that limited their food intake to just 9-12 hours of the day, were able to stay lean and fit no matter what diet they were given. More importantly, the study also tested whether those same mice could take a “break on the weekend” (much like we humans do) and indeed, they were still able to stay fit and trim mice even when taking those weekend breaks in fasting. Here is the graphic from the study and link HERE. I have personally tried intermittent fasting both for the 8-hour eating window AND a 12-hour eating window and I find that both time frames work equally well to one another for my body. The difference I have found is that I’m much more uncomfortable when trying to go 16-hours a day fasted. I have early morning stomach grumbles like crazy and I would rely more heavily on coffee and tea in the morning (without cream or sugar, or it doesn’t count!) which I found unsustainable for my lifestyle. Now that I only eat 12-hours a day (and thereby fast for 12-hours a day), I find it much easier to implement this into my lifestyle and now many of my clients too! If you finish your last meal by 8pm at night, then you simply drink water, plain coffee or plain tea in the morning until your first meal at 8am. For those that are morning people, you may want to monitor your dinner the night before so you can have the breakfast you need at the time that more convenient. 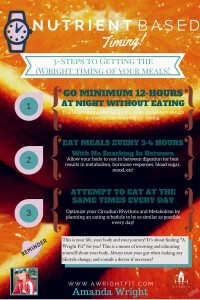 Step 2: Eat meals every 3-4 hours, with no snacking in between! We live in a society where we have immediate access to food. What a blessing that is! But with such access comes the unfortunate tendency to snack or “graze” all day long. I call it “Drive by Eating” in my home. Every time I come across the nuts in the pantry, I gotta munch on a few! Every time I open the refrigerator for some water, I see the grapes and I gotta pop a few into my mouth! It is mindless and I’ve had to put some parameters on myself in an effort to stop! Some of us have heard that we need to eat “every 2 hours” when trying to lose weight to “speed up our metabolism.” But recent studies have actually debunked that myth. The reality is that it all depends on your body and how fast your digest and break down your food. It also depends on the size of your meal (which we’ll get to in Part III of the Nutrient-Based living!). So some bodies WILL eat 5-6 meals per day because they will digest their food fast enough. But more commonly, most of us will eat 4 meals a day, which allows adequate time in between meals. You are more likely to eat when you’re body is actually hungry, not just when you’re craving something. You give your digestive system adequate time to reset its digestive hormones and secretions necessary for adequate and efficient food break down. Helps you maintain normal blood sugar and insulin responses. Allows your body to use energy toward detoxing your systems instead of only focusing on digesting. The amount of time you need to wait in between meals is unique to your body. Since you are eating a full, Nutrient-Based meal for every meal, the size of this meal should take at least 3 hours to fully digest, if not more. The fiber, the protein and the fat in our meals do take a while to break down. Some of you might have much faster metabolisms which means your body will become physically hungry much sooner. 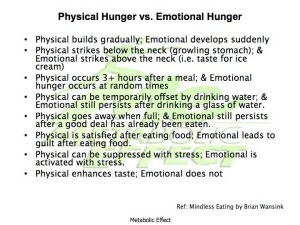 I encourage everyone to determine signs that you are “physically hungry” versus when you are mentally or emotionally craving something. Here is a graphic from Metabolic Effect that I think sums it up really well! To ward off the tendency to have high cravings or emotionally eat in between meals, drinking water or herbal and green tea (without sugar or cream!) is really helpful in keeping your stomach happy and your body circulating! The reason for trying to time your life to be similar day to day is because of the value add of going along with your Circadian Rhythms. To get to the point, many functions in our body is regulated best in a rhythm, including when we eat! To optimize these rhythms, the goal is to eat around the same time every day! Your role for your body is to asses and see what times of day work best for you! Circadian Rhythms (CR) certainly contribute largely to our sleep/wake patterns in our life since they are highly regulated by the light and dark responses. But studies have shown that they can also be regulated by the timing of eating! Eating at times when our bodies are in “rhythm” to eat is ideal for metabolic responses to be at their best. Finding a patterned rhythm of eating that best supports your metabolism is one of the best things you can do to promote your healthiest, most energy efficient, and LEAN bodies possible! Sporadic eating does not contribute to helping find the natural “rhythm” of your body. It causes some disruption to these natural rhythms and causes more internal stress than you know. In reality, we all know that we don’t always eat just when our bodies are hungry. That would be too easy! -We eat just because it’s 12-Noon and we think “oh, I must have lunch!”. -We eat because we schedule that dinner with the couple at that certain time. -We eat because everyone else around us is eating. We eat because we’re bored or sad or happy. Just becoming more aware of an eating pattern (and sleep and wake pattern too!) is a great first step in finding your best rhythm for your energy! Map out your typical schedule. Start with the time you’d like to wake-up and the time you need to go to bed (getting 7-9 hours of sleep). Start with those personal qualities that are important to your eating life and require priority in planning. —Do you workout early in the morning or evening? —Does your family stress the importance of family dinners? —Do you have a designated lunch hour that you need to stay within? —Are there times of the day that you are most active and therefore most hungry afterward? -If there is a particular meal time that you know you already are akin to, start THERE. Don’t try to force something different from that important spot. 4. From that time, designate a meal 3 hours before and 3 hours after (as many times as necessary) until you get about 4-5 meals. Some meals will be bigger some may be smaller. 5. Assess and be sure that you are able to implement the 12-hour window of Step #1 given this timeline and map. *Everyday, I get up at 530am and go to sleep at 9pm-930pm. *My main meal priority is my workout, which I typically do at 10am. Therefore, my priority meal is right after this at 11am. IF, I need to change my workout that day, I still don’t change my meal timing. I try to fit in the workout in a way that will allow be time to keep this schedule (so I’d try to workout at 12/1pm, or 4pm). As with all things about your body, this is an investment in time and requires patience for you to learn about YOU! What works for me, may not work for you. What works for you may not work for your sister! But the payoff to some true, intentional investigation into your body, will be tremendous! Remember, you are not put on this earth just to look a certain way! You are put here for a GREATER PURPOSE! Your LIFE must be LIVED in order to fulfill that! Taking care of your health in your responsibility and the gift that you give back to God for the amazing, although at times HARD, life you have been given! Your hard work will pay off in ways you can’t even imagine! Just take it 1… 2…or 3 steps at a time! Have any questions? Comment below or contact me at amanda@amandawrightfit.com!